"A most brilliant and sensitive musical talent"
"Being a composer himself has endowed the performer [Motoki Hirai] with a special insight into the works of others, enabling him to capture the essential character of each composition." "His interpretation was sophisticated and left a strong impression on the audience. It was as though the doors to the most sublime music of our time were being opened note by note right before our eyes." ". 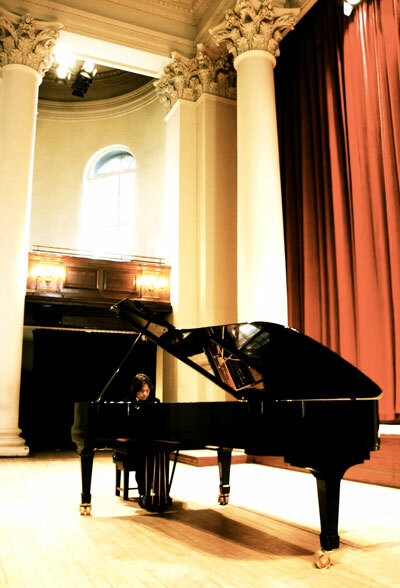 . . superbly performed, technically perfect and infused with keen intelligence"
"a superb pianist . . . his musicianship is incomparable." "Mr. Hirai's unhurried approach and ample breathing between phrases brought to mind a great singer or string player"
"A performance full of lyricism and sheer vitality"
"He plays piano with such an extraordinary sensitivity of touch, such delicate variations of tone, such extremes of dynamics"
"A most excellent recital and we look forward to seeing this fine artist in London again soon." ". . . consistent musicality"
"His virtuosity was at the service of the composer, his rubati were delicately responsive to the implications of the music"
"warm lyricism and a uniquely improvisatory feeling"
"a solid technique whilst having a remarkable gift of spontaneity"
"His emotional range, versatility and imagination is simply outstanding"
"His music making has all the sparks of genius"
". . . poetic and sensitive"
"a very gifted player whose artistry places him highly among his national contemporaries"
". . . beautiful moments of lyricism"
"a superb pianist who can draw sounds from the instrument that could be strings, wood wind or full orchestra . . . his musicianship is incomparable"
"No one can call Motoki Hirai a cookie cutter pianist. In a program that included works of Bach, Schumann, Chopin, and himself, he brought distinct individuality to each work." "The pianist, Motoki Hirai, showed an exceptional musical talent with an incredible ability to communicate with the audience"
"Warm applause were rewarded with four encores included Schubert-Liszt's 'Litanei auf das Fest Aller Seelen' . . . It seemed the pianist could have continued to play all night"
"[Partita in B-flat] was beautifully clean-cut, no affectations, every voice clearly denoted." "… Bach's C minor French Suite, which was quite superbly performed, technically perfect and infused with keen intelligence." "He played the piece [Partita in C minor] admirably bringing out the rhythmic character of each dance movement." "Mr. Hirai's unhurried approach and ample breathing between phrases brought to mind a great singer or string player, and it may be worth nothing that his father is celebrated cellist Takeichiro Hirai, prominent student of Casals. . . . Mr. Hirai's pacing and conception proved similarly artful throughout the rest of the Suite [Bach's French Suite in C minor], especially in its reflective Sarabande. His control was remarkable throughout." "[Partita in B-flat] immaculately played, every note perfectly enunciated, all the parts clearly audible." "Schumann's Arabeske, Op.18 . . . warm lyricism and a uniquely improvisatory feeling"
"Motoki Hirai played Schumann [Humoreske, op.20] with abundant lyricism, sensitivity and fantasy." "[Sonata in G minor, Op.22] had fine phrasing and many thoughtful details"
". . . eloquent expressiveness and vigour marked his performance of Chopin." "
"…a winning account of the C-sharp minor Scherzo"
"All [Selections of Chopin's works] showed beautiful moments of lyricism"
". . . his performance intensifies to reach a most exciting climax"
"The Spanish idiom rendered in such a natural and unassuming manner"
"He vividly brought to life the Iberian flavour of Albeniz's music"